Math riddles and number puzzles that challenge your lateral thinking. Test your logic and calculation skills with these numerical conundrums. Get the obvious answers to math riddles. Do you love math? Love numbers? Love the thrill of problem solving and the quiet satisfaction of finding that one right answer? If so, these math puzzles and riddles in mathematics are just for you! When asked how old she was, Suzie replied, "In two years I will be twice as old as I was five years ago." How old is she? Take eight small sticks, four of which are half the length of the other four. 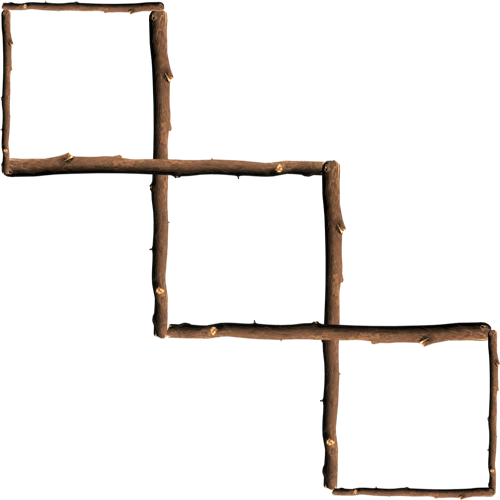 Make three equal squares out of the sticks. Use the longer four sticks to be sharing sides between the squares and at the end their should be three intertwined squares. There is a certain club which is for men only. There are 600 men who belong to this club and 5% of these men wear one earring. Of the other 95% membership, half wear two earrings and the other half wear none. How many earrings are being worn in this club? Six hundred. We know that 5%, or 30 of the men are wearing one earring. Of the other 95%, or 570, we know that half are wearing two earrings and the other half none. This is the same as if they all wore one. How can you make the following equation true by drawing only one straight line: 5+5+5=550 Can you figure it out? Draw a line on the first plus sign that turns it into a 4! The equation then becomes true: 545+5=550. You could also change the equal symbol to a crossed out equal symbol which means "not equal to". It's true. Think roman numerals. Fire up your brain and see if you can remember your multiplication tables and more! See! There are reasons to use math outside of school!